Meringues are made from sweetened egg whites that have been beaten to form stiff peaks. The baking process is really a prolonged drying over several hours in a warm oven. To make it easier to remove the meringues from your baking sheet, you can spread parchment paper over the baking sheet before you place the little mounds of beaten egg white on it for drying. Although parchment paper is ideal, there are a number of acceptable substitutions. Silpat is a silicone baking sheet liner that is a favorite of professional bakers. These sheets are made of silicone and can be reused over and over again. None of your baked goods – from breads to meringues – will stick to silicone, making these a great, all-purpose baking aid. Waxed paper is the most similar substitution for parchment paper. Waxed paper has a slightly higher tendency to stick to the meringues during baking, so be careful when you are peeling the paper away from the dried meringues when they are finished baking. Next in line for substitutions similar to parchment paper comes aluminum foil. The flexibility of the aluminum foil allows you to easily lift the meringues off your baking sheet and gently peel them away from the foil, individually rather than trying to scrape them off the pan with a spatula or knife. Just like parchment paper and waxed paper, aluminum foil cuts down cleaning time by eliminating the need to scrub your baking sheet. Silicone rubber molds allow you to create perfectly shaped meringues. The molds come in a variety of shapes and sizes which allow you to be creative with your meringues for stacked desserts to create beautiful presentations. Because the molds are flexible, you can gently turn each well inside-out to release the meringues one at a time. When all else fails and you don't have anything on hand to line your baking sheets, you can lightly coat the pan with cooking or baking spray. Baking sprays contain a small amount of flour designed for releasing pastry and baked goods from pans. 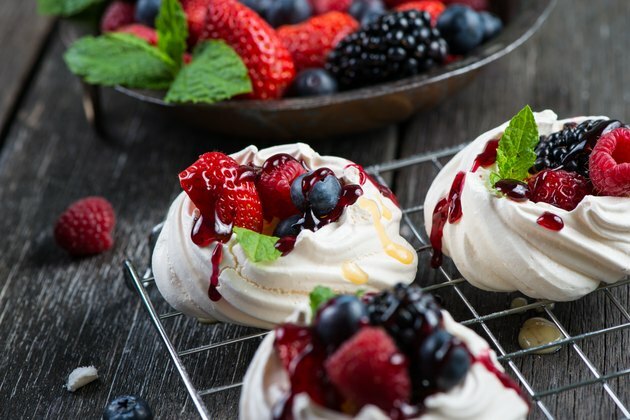 If you are using cooking spray, you may lightly dust the oiled surface with confectioner's sugar to help facilitate the drying of the meringues as well as their release from the pan. How Safe Are Silicone Baking Sets? Can You Use Aluminum Foil Instead of a Baking Sheet to Cook Cream Cheese Poppers in the Oven?